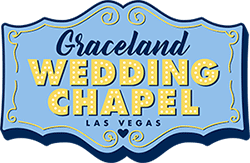 Graceland Wedding Chapel is recognized around the world as the very first chapel to conduct an Elvis themed ceremony in 1977. Located right on the Las Vegas Strip for more than 70-years, our absolutely charming venue offers traditional wedding packages as well as the now-famous Elvis themed weddings and renewals of vows which have become an extremely popular (and incredibly fun) Las Vegas activity over the past decade. Only Graceland Wedding Chapel can say "we are the original". We offer fresh flowers, silk flowers, digital photography, limousine service, DVD recording technology and ceremonies broadcasted over the internet to make your wedding in Las Vegas memorable and an event to be cherished for your entire life. So whether you are looking for a Traditional Ceremony or our signature Elvis Wedding in Las Vegas, we are here to serve the needs of all Las Vegas Weddings.